Description: If you ever wished that you could copy more than a single clip from one document before pasting to another, 101 Clips is for you. With 101 you can copy up to 25 times and unlike other multi clipboards, 101 shows you a preview of each clip before you paste it. It can also be set to remain on top of your working program. 101 handles all forms of clips including multi graphic Word clips. Description: The 1St Choice Clipboard floats on top of your current work. Whenever you cut or copy, the clip appears in one of the slots. The slot only shows the first few words of each text clip or the words "Graphic Clip" but when you move the mouse pointer over the slot, a preview window appears showing the first several lines of a text clip or a thumbnail of a graphic clip. This makes choosing the clip you want to paste very easy. Description: 1st Clipboard can copy and store up to 25 items at a time. This gives you the ability to bulk-paste items, both to documents and spread sheets. The variety of options includes, auto-minimize after pasting, bulk-pasting, clearing the Windows clipboard, editing clips, reducing graphic clips, keyboard pasting and screen capture as well as many more features that makes it the best software for saving your precious time. Description: Improve the performance for your computer drastically. Our service manager allows you to use service presets to fine tune services without needing any knowledge. 7Smoker Pro includes a One Button Autotuner that will tune your system to perfection based on the configuration of your system. Simple for beginners. Powerful for experts. Description: 8Smoker Pro allows you to change various settings in the Windows Registry. These settings can boost the performance for your computer drastically. 8Smoker Pro gives you the ability to easily Disable or Enable CPU Core Parking. In most cases disabling core parking makes Windows 8 seems Snappier. 8Smoker Pro is simple for beginners. Powerful for experts. Description: 98/ME Smoker is a Windows 98 and Windows ME tweaking utility that will help to reduce system bottlenecks, decrease boot times and increase system stability. In addition 98/ME Smoker has a new State-Of-The-Art internet optimizer that will tune any internet connection to perfection. Boost your dialup, cable, dsl, satellite, etc. Get it, or stay slow! Description: Quick Reinstalling Windows without any data loss! Almeza MultiSet automates installation of any version of Windows, complete with all the latest service packs, patches and security updates. It installs a pre-configured, ready-to-use operating system to all computers in your organization. Save weeks of monotonous work by installing and configuring all required applications completely unattended! Description: Ever need to change attributes (date and time of their creation etc.) of files and folders? Quickly? As you know, with Windows it's tedious and slow. Not so with Attribute Manager! Attribute Manager allows you to change Read-Only, Hidden, System and Archive attributes. You can change the date and time of creation, last access, last modification of files and folders. 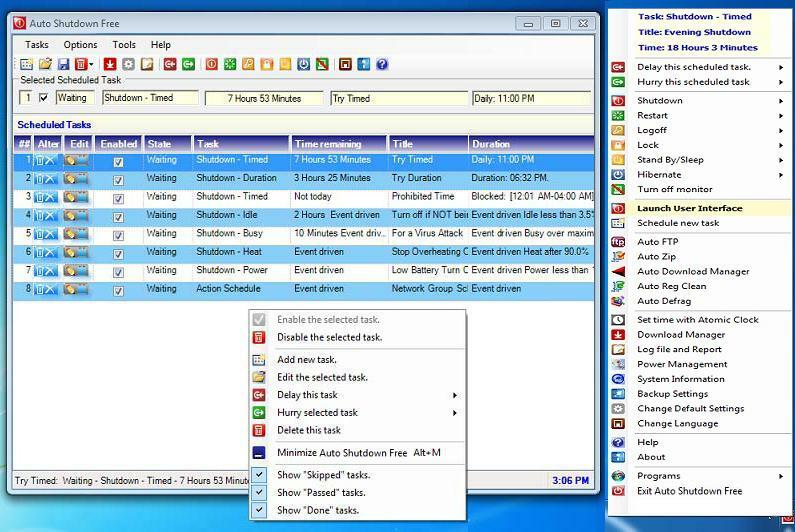 Description: This software is handiest, newest software to help you automate shutdowns, countdowns, restarts, hibernates, sleeps, power on, power off, log off, locks, turning off the monitor all at schedule times you specify. 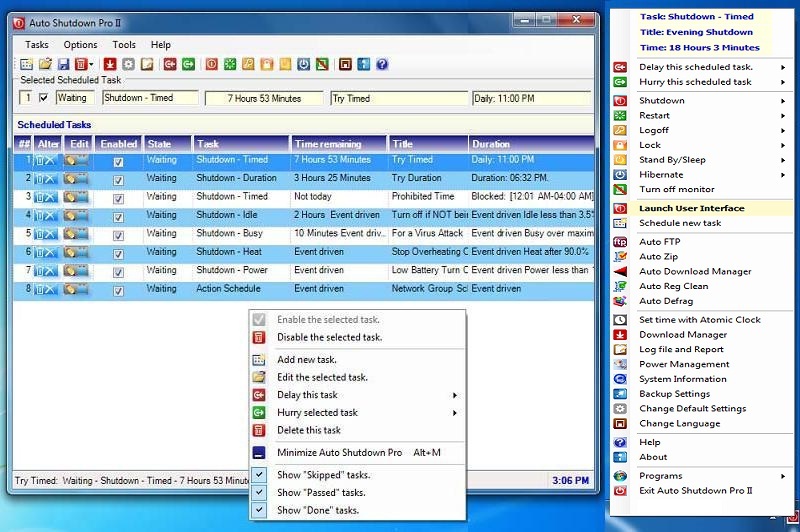 Plus it has these added options to shutdown the computer if idling, a countdown message, the ability to play tunes, display videos, messages, and URLs, files, kill running programs, allowing for multiple tasks, and more. Description: This software is a computer management tool, that will double the life expectancy of a computer while saving electricity. It handles shutdowns, sleeps, power on, restarts, logoffs, locks, hibernations or turning off the monitor. It launches or terminates programs, opens files or URLs. Scheduled triggers are time, duration as a countdown of time, busy, idle, heat, power, or blocked time.